So you're having trouble finding the perfect gift, but you know exactly what it should be. You can see it in your head, but you just can't seem to find it no matter how much time you spend in the dreaded malls or online. Time to think about 3D printing. No clue where to get started? I ran a little search for you: "3D printing for beginners" and it returned tons of resources and DIY instructional videos. If you're artsy, you can download design software and draw up your own requirements. Not so good with the drawings? Here's a search for "3D printing templates" which contains sites like Thingverse where makers from all over the world upload their own designs for re-use by n00bs like yourself. Don't have your own 3D Printer? No problem! Turns out that there are companies all over the place that would gladly take your designs and make them real. Even your friendly neighbourhood Staples store, according to this recent Wired article. Industrial printers offer the benefit of a range of materials: home printers like MakerBot usually use plastic resin, but industrial ones can use wood, resin-coated paper, metal, even chocolate. The one thing to keep in mind is that you can't print out anything that is protected by copyright. Well, you can at home (albeit while violating copyright law) but third party printers will not accept these types of projects. So you can't print out the Lord of the Rings Lego set just because it's sold out at your local toy store. But you can invent your own crazy Lego pieces and print those out to supplement your kid's collection. And what about coasters, vases, candleholders, smartphone cases, bowls, keyrings, etc etc etc. 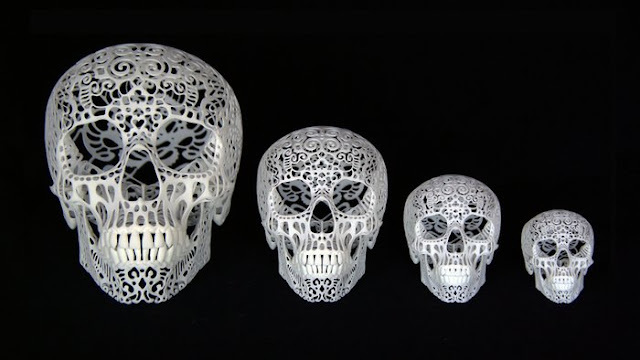 This method of printing allows for really intricate designs too, as you can see from the skulls by AhaLife pictured above. Which reminds me: what if you don't consider yourself creative enough to even come up with a design idea? Again, the Interwebs come to the rescue. There is a whole industry now around selling 3D printed products. Often the companies are the same as the ones who will print on your behalf, while others were formed by makers who were designing and printing their own creations, and then started reselling them.